I love finding new music that I was completely oblivious to. Who doesn’t? This time I have found the Louisville “band” The Parade Schedule and it was a very welcome surprise indeed. The reason I have band in quotes is essentially The Parade Schedule is Matt Kinder with a little help from a rotating list of contributors/friends. The new album “Seeds to be Planted, Trees to be Cut” was just released this December and it is an acoustic folk record at heart that has a lot of heart…you could say. Kinder has a timbre of voice that comforts, it is not a new age indie “off key” voice, but actually a pretty straight forward voice that goes hand in hand with his sombre lyrics and even more solemn guitar strumming. This isn’t your intense finger picking folk style album, it is a drifting and beautifully soothing collection of songs (14 to be exact, more than the average album these days!). While I originally found it on IODA, I quickly devoured the two tracks below (“Backyard” & “Dye Your Hair”) and immediately hit up eMusic for a copy of the full album. The two tracks included and aforementioned are both cut from the same cloth and could actually be a part 1 and 2 of the same song at first listen. When listening to the remainder of the album, you will be immersed in lo-fi acoustic tracks, with echos of a less twang induced Johnny Cash at times. You might even see a little bit of early Damien Jurado in “Making Away”. Stand out tracks include “Backyard”, “Eight Long Months”, “Be Safe” and “Dancing” as of the first few spins. p.s. 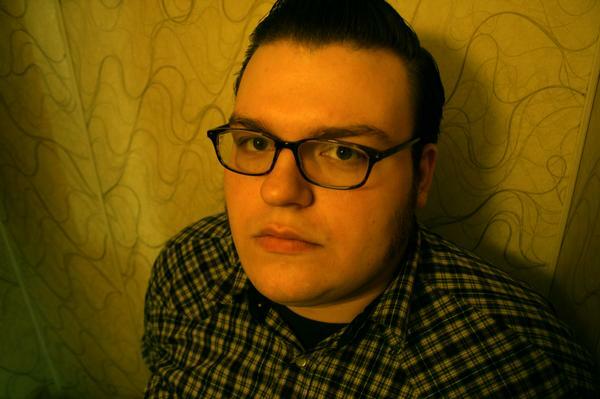 The above photo of Matt Kinder has a tag of “My serious band photo” on MySpace, love that about this guy too! Matt is great. He plays so much around town that I have no idea what took me so long to see him live. But I finally got to see him with Bowerbirds a few weeks back. Sooo good. @Sean, nice and with Bowerbirds too. I am really liking this album, totally my speed! Just bought the pack over at The Records Machine. Capybara sounded interesting too so I thought wth. Even though I have an account at eMusic 5 albums for only $15 is a great deal. As always the tips you get here are dead cert to be great. Thanks S and have a Happy New Year! Hm, I had not much time for reading blogs the last days and so I totally missed this fine, fine post of yours. But now everything is back to normal and I’m taken aback by the great tunes you posted. Great find, thx!